WHO IS THE DANGER HERE? The British Guardian newspaper ran a story yesterday called "Pre-Emptive Nuclear Strike a Key Option, NATO Told." 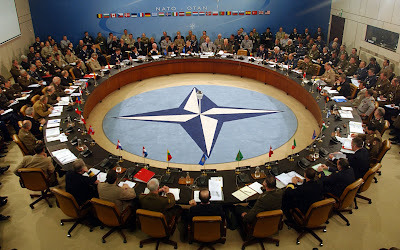 The newspaper called a new report, written for NATO by five top military officers, "a radical manifesto". The former armed forces brass from the U.S., Britain, Germany, France, and the Netherlands called the nuclear option an "indispensable instrument" that must be used if necessary in a pre-emptive attack to stop the spread of nuclear weapons. Yes, you read that right. NATO, nothing more than a U.S. military tool to spread war, wants to use nuclear weapons to protect the "west's values and way of life" which are under threat by crazy people who want to use nukes, they say. Here are the actual words from the 150-page blueprint for disaster: "The first use of nuclear weapons must remain in the quiver of escalation as the ultimate instrument to prevent the use of weapons of mass destruction." Oh boy these folks are crazy for sure. Ok, let's look at what is really going on here. The U.S., which has always controlled NATO, is growing worried that a unified Europe, through the European Union, will soon have their own military alliance and won't need NATO any longer. That of course means less influence for the U.S. and the loss of a big military "tool" that has been useful as it is in Afghanistan today. The NATO report just happens to also call for the consolidation of the U.S., NATO, and the EU into a new pact for a "grand strategy". This is not likely to happen as much of Europe is increasingly worried that the U.S. has gone empire mad. Along these lines, the NATO report calls for a shift from consensus decision making in NATO to simple majority voting. The U.S. wants to increase its leverage and ability to drag NATO into more military adventures without having to bring all NATO member nations on-board. The report also suggests NATO agree that military operations could be undertaken without obtaining U.N. Security Council agreement, once more reenforcing the fact that the U.S. wants to use NATO as a first-strike tool. The report says that "the west is adrift and not facing up to the challenges" around the world. Here the five generals are trying to shame NATO members into "cowboying up" their testosterone levels and agreeing to move NATO into a perpetual state of war with those not submitting to the dictates of corporate globalization. NATO should have been disbanded right after the former Soviet Union collapsed. Today it is a dangerous guard dog run amok, not only in the European neighborhood, but globally. NATO is not out fighting for freedom and democracy either. They are a tool of the international mafia - now commonly called the military industrial complex. This NATO report should be tossed in the trash. In its place should be a global debate about the need to shut NATO down before they do indeed use some of their nukes. Clearly NATO is the danger these days.